Free games: We have 2000 Steam keys for PvP wizard arena game Spellsworn up for grabs! Imagine PUBG but you’re all wizards. That is Spellsworn in a loosely-fitted nutshell. Who will come out on top? That depends on your wit, speed, and accuracy. If you want to have a go at this PvP arena game then stick with us and grab a free Steam key below. Want more games you can play right now? Check out the best free PC games. In Spellsworn, each match can have up to eight online players – either in free-for-all or working in teams – all duking it out to eliminate each other and be the last spellcaster standing. The arena has cover for you to hide behind but you can’t wait around too long as the lava (or other hazard) around the edges slowly moves in – damaging anyone who touches it. You can have loadouts Spellsworn across five different disciplines: Offensive, Defensive, Area, Utility, and Travel. Each of them have different spells that demand a different playstyle. You could launch fireballs at your foe, but a craftier tactic might be to travel quickly across the arena to attack their flank, or you could repel their own spells back at them. Whatever spell you do choose to cast in each moment will have to be heavily considered. Not only because you need to assess the battlefield and what your opponents are planning, but also due to the limited mana pool available to you. Casting a spell drains your mana so you’ll have to wait to cast another. 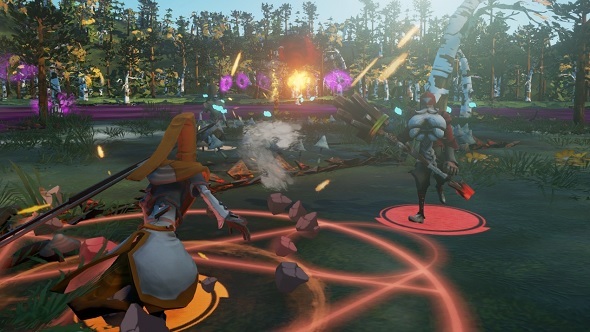 Spellsworn is currently available for £6.99/$9.99 on Steam but it will be free-to-play soon. You can read about the changes that will bring to the game here. In the meantime, grab yourself a Steam key from the widget below – just complete one of the actions and you should get it straight away.